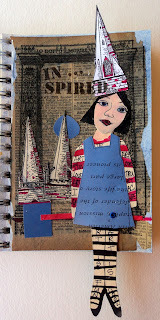 February Challenge at Art 'N Soul Studio Facebook. Challenge was Hearts and Flowers. I started with two pages of journaling about the word "Heart", then covered with paper napkins, paint, gesso, ink and cut out hearts. 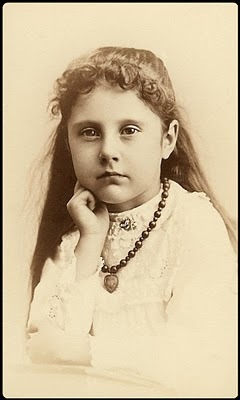 I love the quote from "The Secret Garden" by R. Bennett; "Be led by the dreams in your heart." "Be led by the dreams in your heart"
"BIRD" was the theme given by Take A Word. This is my take on Bird. It's a Journal Spread, with various layers of papers, stamps, stencils and image transfers. Great fun. When I found the image "Live Gently Upon This Earth", I was Wowwwwwed. Take time to check out the other cool things the other artists made, lots of awesome stuff at Take A Word Blogspot. Current challenge for ,The Tree Muses Challenge theme was Umbrella. My journal page started with journaling, deli wrap print of Music of Singin' in the Rain, and a painted collage of Gene Kelly and Debbie Reynolds under the umbrella. What a movie, full of fun, laughter and love for life! 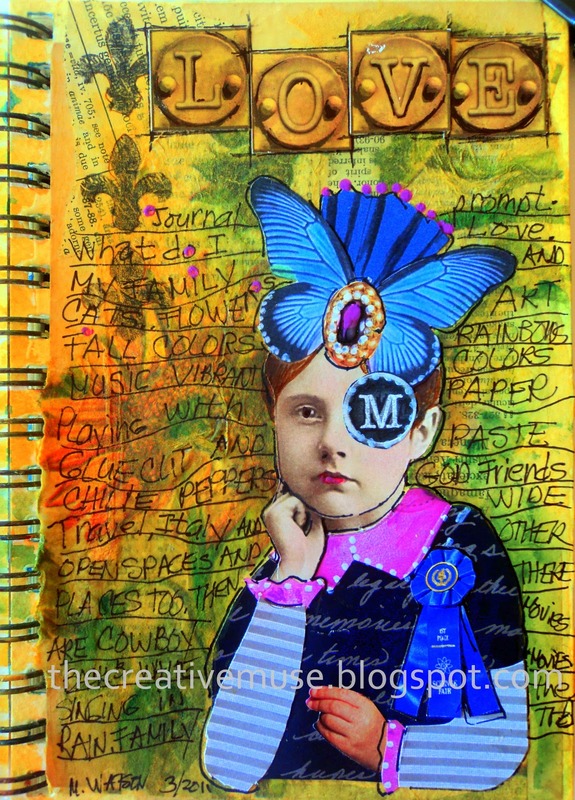 Go check out the other super entries over at The Three Muses. I'm still using primitive art methods, paper, paint, glue and found stuff, wish I could figure out this new Digital Art, but alas.... too old, too late. This is my take on the Turquoise and Red Challenge, I used lots of red magazine clips, distressed paint, journaling (hidden under the paint) and one of hubby's cigar wrappers, what a lovely necklace for the Lady in Red. Head on over to their blog and see all the other fantastic art work. After almost seven years off... I'M BACK. Life has had it's UPS and DOWNS, now it's time to Get Creative. This little page was made as a challenge for "TRY IT ON TUESDAY" The challenge was Fire and Ice, using Hot and Cool hues. As my Muse took over it became obvious the piece would have NOTHING to do with fire or Ice, but I did stick to the Hot and Cool. Great Fun. To find out more about Breast Cancer go to Think Pink Live Green. Live Green is a way of living that aims to help women reduce their risk of breast cancer or the disease coming back in survivors. It’s also a way for women living with advanced disease to make the healthiest choices possible. Cathy Calamas and I traded ArtfulBag ATC's this month. It was part of the year long Artful Bag extravaganza inpired by FrostedPetunia. 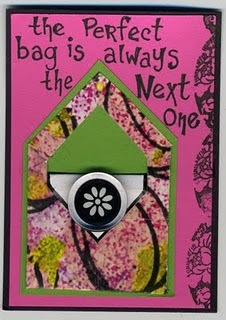 http://frostedpetunias.blogspot.com/p/artful-bag-challenge.html. April Journal Prompt... Send an Imaginary Post Card. 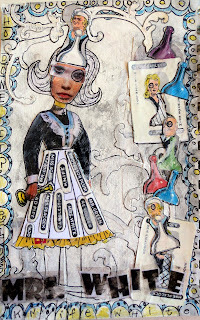 My kitty, Jezabelle and I headed off to La La Land and found all sorts of cool things going on. Lolly pops growing like spring flowers, butterflies made of chocolate and of coarse, Jezabelle could talk. Post Card is addressed to Mom and Dad to my childhood home address. Way fun! Gone Too Soon... No challenge, just me and the journal talking about life and loosing. " I went though all our photographs, memories made through out the years, pictures worth a million words that bring my heart to tears...... My father gone in early prime, my brother next in line , then last my mom. And so, my wings shall visit you until my time is come." Vintage arithmetic pages, stamped and collaged, painted, colored, butterfly stamped, face painted with acrylics, colored pencil, gesso. Frosted Petunias Artful Bag Challenge for the month of March was Embellish. I start ed with a plain little green bag. Cute, but not Special. The oriental pin has been laying in my bead re-do pile for years. I added more beads and made another hangey down bead thingey that attaches to the strap. It will probably drive me insane the first time I use it, but looks cool just for the sake of ART. The challenge this week at "Sunday Postcard" was WHITE! Think you can't be inspired by White, well think again. My mind drifted back to my childhood playing Clue, much more fun than Monopoly cause you didn't have to worry about been a land tycoon or handling money and always landing on Boardwalk with those nasty hotels. Oh well... anyway, Mrs. White just kind of jumped out from the shadows and here she is, holding the candlestick. Too bad, she's been busted. 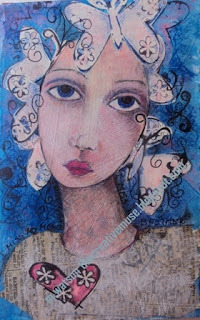 Hop on over to http://sundaypostcardart.wordpress.com/ and see what other cool stuff has been created with White! Thanks for dropping by! Take A Word " Architecture"
Three Muses "Land of Odd"
Writing about the things we Love is a snap. Writing about the things we Hate is a snap. The grey areas of life are the one's that keep eluding us, leaving us sometimes empty and unsure of ourselves and our place in the world. Perhaps I should really tax myself and do a Grey Area Page. Maybe another day, my brain is entirely too befuddled right now. 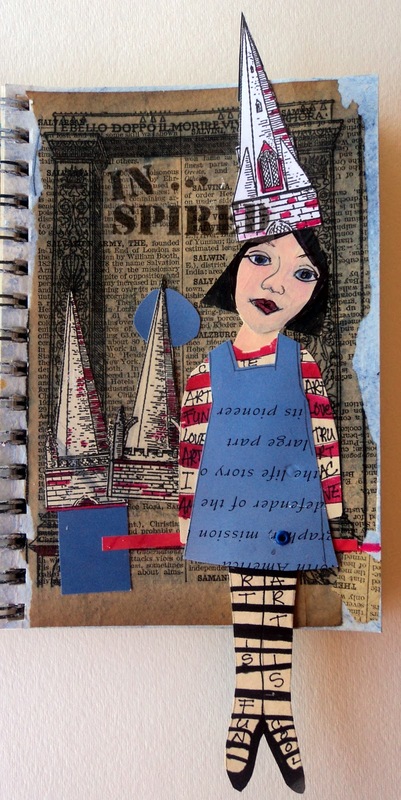 This is a two-fer, fotocollage challenge and journal prompt too!! The image of the little girl came from http://fridayfotocollage.blogspot.com/ , the picture below was our challenge; I altered the image and made the journal page on the top. Our Journal prompt last month was "What do I Love:, you can see every one's pages at http://www.flickr.com/groups/1570781@N20/. 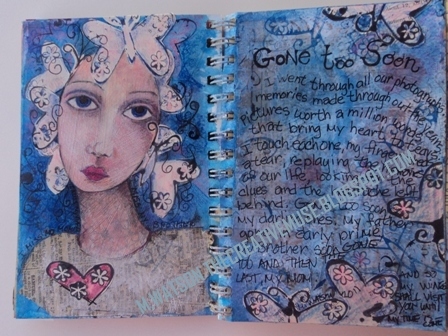 I used transparency film to make the three small Fleur de lis in the upper left of my Journal Page. Amy at "Butterscape" has been tantalizing us with transfers and other creative topics, so the transfer thing has been heavy on my mind. A few years back I did transfers, but have since lost (well... misplaced... its around here someplace) the film. On a thrift store trek yesterday, what did I stumble upon? 100 sheets of transparency sheets for a whole whopping $2.99. I was really pissed when they wouldn't give me my senior discount, alas old farts discount is on Tuesday. Let me get my math correct here, I paid 30cents a sheet! It might not be as good as Lazertan, but it's working for this old girl. Moral to this story, check out Amy's blog http://butterscape.blogspot.com/ and don't leave a stone unturned on your thrift store visits.